Millennials represent an attractive group for food manufacturers. 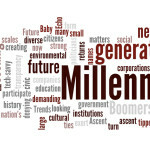 Defined by demographers as those born after 1980 and before 2000, millennials represent $1.3 trillion or 21% in consumer spending according to a report by the US Chamber of Commerce Foundation. The Food Marketing Institute’s (FMI’s) 2014 U.S. Grocery Shopper Trends Report found millennials spread-the-word and discuss these purchases with others through social media and other avenues. Considering the preferences of millennials will go a long way towards reaching this potential customer base.